Dave Stokes won the Ivan Marks Memorial match. There was a big turnout for the Ivan Marks Memorial match fished for the first time on Ferry Meadows lakes. With some of the best feeder anglers in the country lining the banks, some big bream weights were expected. But unfortunately the conditions were far from ideal. This match though was more about paying respect to one of the world’s greatest ever anglers than bagging big nets of fish. Venue regular Dave Stokes topped a strong field and took home the £300 winner’s purse plus a trophy with 44lb 5oz from peg 122 on Overton Lake. 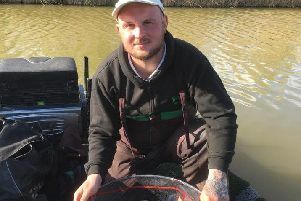 Casting regularly at long range with a groundbait feeder filled with chopped worms, casters, maggots and chopped sweetcorn, Stokes waited over an hour for his first bite and then took odd fish until an hour-and-a-half from the end. That’s when he enjoyed a good run of six fish in as many casts. He ended with three big bream to 6lb plus lots of skimmers on a variety of baits. Runner-up from peg 80 on Gunwade Lake was Sam Collett, who used a small Method feeder with corn and maggot on the hook for a level 42lb. The match was organised by Leicester Tackle Shop Match Catch and Ringer Baits, and raised £625 for Papworth Hospital and Macmillan Cancer Support. There was also a charity match at Float Fish Farm in aid of Help The Heroes and top rod here was Michel Brooker. He dominated proceedings fishing a Method feeder at the start then switching to paste fished on a long pole line and short down the margins to finish on 95lb. Runner-up was Mark Elliott with 51lb 15oz and third Paul Hollingsworth on 44lb. The Sensas Mark One squad were in good form at the weekend with two very good performances which should set them up nicely for the forthcoming Angling Trust Winter League and indeed for their trip to France in a couple of weeks time to compete in a big Euro final. They had to split up the squad so that they could fish two big events on Sunday. They came a very respectable third in a smaller than usual Eastern Region Shield match on the River Yare in Norfolk while over on the River Ouse at St Ives, a venue they know well, they ran out winners taking the HAJAC Teams of Four event. The river fished well despite the low and clear conditions, with roach showing on most sections. The Sensas Mark One team of Rob Hewison, John Price, Josh Pace and Pete Wills scored 14 points to just edge out Browning Hotrods on 15. Individual winner was Paul Spriggs with 13lb 1oz of roach taken on the pole with maggot and also a few better samples with hempseed. Price came second on 11lb 8oz and Ricky Young third with 10lb 6oz.